July 22, 1864. Sweeny`s 2nd div., Dodge`s 16th A.C., [USA], having been held in reserve N. of the Ga. R.R. 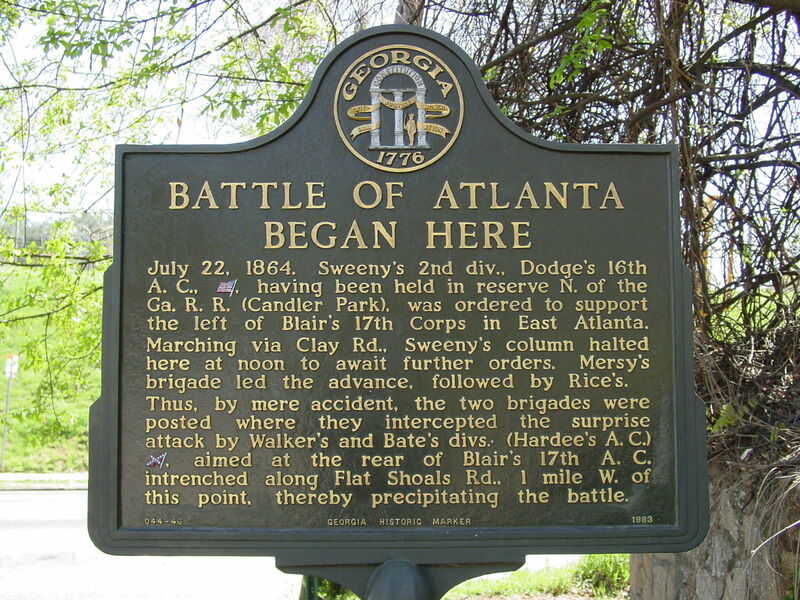 (Candler Park), was ordered to support the left of Blair`s 17th Corps in East Atlanta. Marching via Clay Rd., Sweeny`s column halted here at noon to await further orders. Mersy`s brigade led the advance, followed by Rice`s. Thus, by mere accident, the two brigades were posted where they intercepted the surprise attack by Walker`s and Bate`s divs. (Hardee`s A.C.) [CSA], aimed at the rear of Blair`s 17th A.C. intrenched along Flat Shoals Rd., 1 mile W. of this point, thereby precipitating the battle. © Department of Community Affairs 2015 - All Rights Reserved.